So I sent out an email a few days ago mentioning that January is probably the best time to look for jobs all year. I got a couple responses from readers looking for steps they could take to prepare for an upcoming job search (this was written in December, so they want to be ready when January hits). The advice below is what I’d do before sending out any resumes or applications. Use this when you know you’ll want to be job hunting soon and you want to be 100% ready. Here are five steps I’d follow to set myself up for a successful job search, in order. 1. Tweak your current resume to get it perfect. Think about some of your recent accomplishments at your current job, and list them on your resume. Put numbers, facts and statistics. Giving percentages, dollar figures or other stats is a lot more impressive than saying “top performer,” etc. Here’s a walkthrough of what the perfect resume should include. Once you’ve done this, update LinkedIn for your job search too. 2. Find companies you’re interested in applying to. I like to search on Google and LinkedIn. 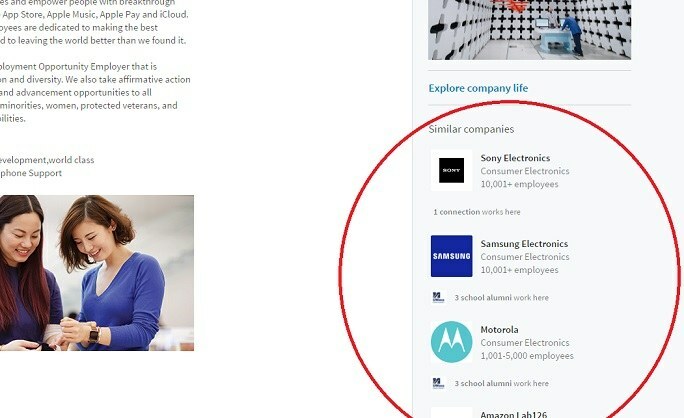 LinkedIn has a great feature where you view one company’s profile, and it suggests six other similar companies that people also viewed (see the image below). You can view those six, and discover six more from each of those companies. Just keep branching out! On Google, try searches like “List of pharmaceutical companies in Boston” or “pharma companies in Boston,” etc. Go to any company’s page on LinkedIn and you’ll find similar companies. You can keep doing this over and over. This example is Apple’s company page. 3. Make a list of the companies that you want to apply to. You can copy the link to the company’s job posting or Careers page, their LinkedIn page, or an email address for submitting resumes if you can find one. Put it all in a Excel spreadsheet, a Google Doc, or whatever you prefer. Now you won’t have to come back and find these companies again when you’re ready to apply and take interviews. The minute you’re ready, you can go to your list and start applying. Also now that you know what jobs you want to apply for, consider tailoring your resume based on the job descriptions. Sending out a generic resume to every single job is faster but it’s going to limit how many companies respond. I’ve tried it both ways and have seen 4 times as many responses after tailoring my resume. 4. If you want to prepare even more, write out some draft emails/cover letters and save them. One for each company you plan on applying to. If you created a tailored resume for that job, attach it to the email so it’ll be saved there. Now you can send all your applications as soon as you’re ready to start taking interviews and having conversations. If you do these four steps above you’re literally one click away from applying for jobs. If you don’t want to go this far, that’s fine. You can save some of this for when you kick off your job search. 5. Think about if you have any friends/past coworkers that can help you. Either somebody with lots of connections, or somebody who works in a company you want to work for. These are the first people you should contact when you’re ready to begin your search. It’s always better to apply directly through someone you know in a company. So your network is one of the first places you should look when starting a job search. Don’t worry if you don’t know anyone who can help though, you’ll be fine with the other four steps above. Want to do even more to set yourself up for success in your job hunt? Awesome. Here’s one more thing you can do. 6. Think about references. These usually aren’t needed until the end of the job interview process. But if you want to speed through your job search you might want to think about two or three people who will tell your future employer how great you are and why they’d be crazy not to hire you. That way when a company asks, you’ll be excited and ready to go… not nervous! Got a question? Want to add anything else that you’ve done to prepare? Leave a comment below and let me know.